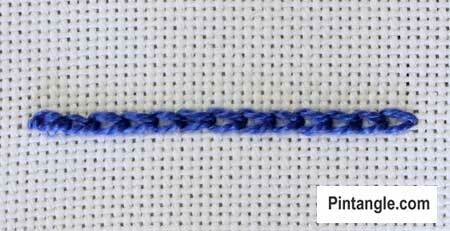 Whipped Chain Stitch is a handy variety of chain stitch as it creates a slightly stronger line than ordinary chain stitch. It stands a little more proud of the surface. 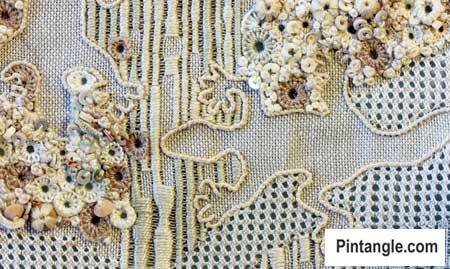 The thread that you use to whip the foundation line of chain stitches with can be of a contrasting colour, or texture. You can also use many novelty threads with this technique too. On the other hand you can use a thread of the same colour as I have done in the sample above. I used whipped chain stitch to outline the shape of the two geckoes before surrounding them in other forms of surface embroidery. To start you need to know chain stitch as the first step is to work a foundation row of chain stitch. Make each chain stitch slightly longer and a little looser than normal because the line of stitching will tighten slightly when you whip it and you dont want your work to pucker. .
With a second thread whip the foundation row by passing the needle under each chain stitch as illustrated. When you do this take care not to pick up any of the fabric. 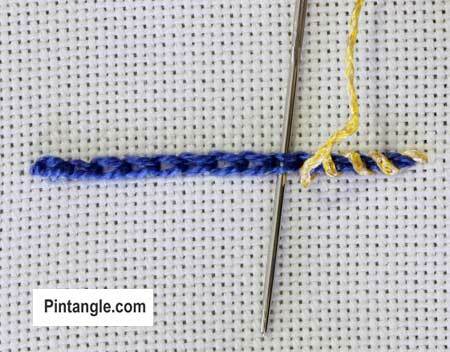 Use a blunt-ended tapestry needle for the whipping to avoid splitting the chain stitches on the foundation row. Continue until the end of the line. This is a particularly useful stitch if a raised line is required on a delicate fine fabric which can not accept a heavy thread through the weave. You can work a foundation row of stitches in a fine thread then whip the line with a heavier thread. This is a fun version of whipped chain. In this version of whipped chain instead of whipping over each chain stitch you whip both sides of the chain working up one side of the line then working the other. It produces a stitch that looks totally different and is particularly effective if you use a different colour thread. Using a metallic thread to whip the side is very effective. Work a foundation row of chain stitch. 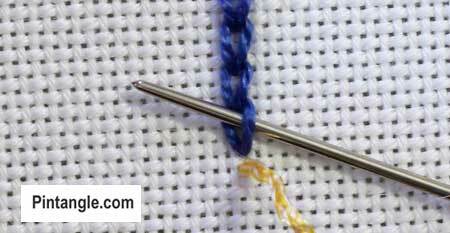 For the journey use a blunt-ended tapestry needle to avoid splitting the chain stitches on the foundation row. Bring your needle out at the start of the line and pass it under one side of the first chain stitch as illustrated. 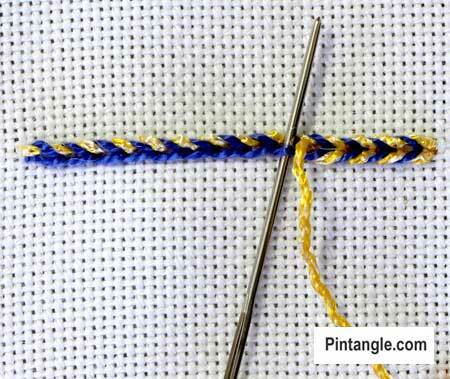 With your needle under the side of chain stitch and pointed towards the centre line pull your needle through. At this stage of the process take care not to pick up any of the fabric. Continue whipping the side of each chain stitch until the end of the line and take your thread to the back of the work. If the line of stitching is lengthy finish the thread by tying off the thread at the back of your work. For the next journey, bring your needle out at the start of the line and repeat the same whipping action along the other side of the foundation chain stitches. 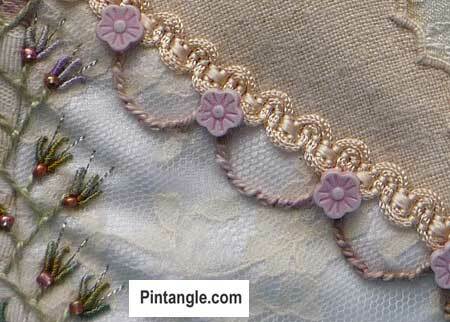 Once again pass your needle under each chain stitch. With each stitch make sure your needle is pointed towards the centre line and take care not to pick up any of the fabric. Continue until the line is completely worked. As you can see the effect is fun and it is easily and quickly worked. Children love it and if the line is not too fine small hands can work it making this version of Whipped Chain Stitch ideal to include in children’s projects. Both of these varieties of chain stitch are members of the Chain stitch family. It was fun to play with this stitch. Excellent geckos sample, so full of texture and dimensional contrasts. I will use this soon! You are so creative. Great colors! Very cool. Thank you so much for sharing your knowledge with us beginners. I love the look of this stitch and can’t wait to use it. I love those lovely creamy oaty colours and decorative stitching. Great inspiration!